Ready to take retail photo printing to the next level? The KODAK Picture Kiosk G20 is the answer. Within its eye-catching, touchscreen display lives a world of ideas and inspiration, making it capable of connecting with customers emotionally, as well as technologically. Featuring wireless capabilities for effortless connections via APPLE and ANDROID OS enabled phones. And thanks to our new software, getting creative is as fast and easy as working with your favorite tablet. ºThe Kodak name on a Kiosk is your guarantee of brand recognition and quality. º Kodak’s award winning software is truly intuitive so that customers can serve themselves. º Thanks to the credit card option little or no staff assistance is required. º Kodak’s attractive price points make it an affordable investment. º Kodak’s host of highly profitable products provide you with immediate return on your investment. Today's Kodak G20 Kiosks are packed with a host of interesting products with very high profit margins, aimed at increasing profits. 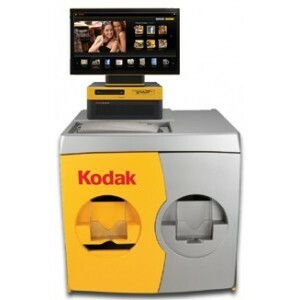 To increase sales, the Kodak Kiosk even promotes and up-sells these products, while the customer is placing their order. With Kodak being one of the most recognized brands in the world and the increasing demand for instant digital prints, it has been proven that a Kodak Kiosk will not just generate profits, it will generate traffic for other parts of your business as well. The Kodak G20 Kiosks have the capability to interface with mini-labs for order processing. This is a smart investment for any minilab owner. Kodak G20 Kiosks deliver beautiful and durable prints in just seconds. Exclusive Kodak perfect touch technology ensures better, brighter pictures. Make prints with rich vibrant colors, sharp details and fewer dark shadows. See the difference that consumers really value! The Kodak Kiosk can create a custom book from 10 to 100 pictures with the customers choice of many available background designs in minutes. Single-sided Photo Books available in 4x6, 5x7, 6x8 and 8x10. Double-sided Photo Books available in 8.5x11. Kodak makes creating a collage fast and easy. The customers have the option to choose from preformatted Standard Collage Layouts Or use Auto Collage to shuffle and adjust the size of their photos, add their own background photo and personalize it with text. The Kodak G20 Kiosks offer many options and styles for creating custom calendars. Single sided calendars can be created in a variety of sizes, and the annual format features one photo and the monthly format features a new photo every month. For birthdays, graduations or any occasion, the Kodak Kiosk enables your customers to create personalized Greeting Cards with their photo and text. They can choose from many different stylish designs to create single-sided cards or traditional folded cards available in portrait and landscape layouts. Decorative borders are a great way to dress up photos with an array of fun, colorful borders, perfect for any occasion. Customers can choose from a variety of designs with different sizes and orientations to fit their favorite photos. Your customers can bring in their old pictures and easily make reprints and enlargements from them by using the Kiosks flatbed scanner for single prints or the rapid scanner for volumes of prints. The Kodak Kiosk offers a broad array of print packages to select from. The customer can create their print package with a single photo, or a combination of a few photos. They can also enlarge photos to 4x5, 5x7 or 8x10. Zoom, Crop, Rotate, Red-Eye Reduction, Sepia Tone and Black & White prints. You can also personalize your pictures with your own messages. Wirelessly transfer and print those fun, spontaneous everyday moments in store from your Smartphone to a KODAK Picture Kiosk. It's fun, fast and convenient. 4x6 / 6x8 printing requires a 68xx printer. 8x10 / 8x12 printing requires a 88xx printer. Double sided printing requires the Dl2100 Duplex printer. Print to print option requires the optional scanners. Creating Photo Books require a binding system form Unibind or another binding system provider. Imagine your customers never being without pictures to print. With Social Network Connectivity, they can connect to Facebook, Kodak Gallery and Picasa Web Albums to access and print any of their online pictures. What a great way for you to cash in on millions of online pictures and encourage impulse transactions. Now customers can look their best with Facial Retouch. It automatically smoothes skin tones, removes or reduces facial blemishes and wrinkles…in seconds. No need to take video and stills of the same event. With Video Snapshots, customers can easily pull still pictures from their digital videos to make prints, collages, calendars, cards and more. And the same great editing tools customers are used to are available for enhancing their pictures. This new easy-to-use editing tool will appeal to your pet lovers. It removes the flash glare from their pet’s eyes.